The older I get, the more I see the world as both a beautiful and yet a fallen place. I think generation after generation after generation, as we’ve heard for thousands of years, we will always have tension roaming as we vacillate from brighter to darker times, then from darkness into light. Conflicts occur between nation-to-nation, community-to-community, family-to- family and being-to-being. Even within our own heart and mind, we find friction and turmoil. I write this on Easter Sunday, a day two billion people come together and reignite hope. Hope is the antidote to this frustration, enabling us to see beyond normal horizons. Maybe for just an hour or so in church, in quiet meditation, in nature, or in yoga, we touch on a peace so compelling that we continue to chase after it. We get hooked, hoping we can find a way to sustain living in this well of abundant contentment. Recently, I had this crazy dream. I was sleeping on my stomach with arms out wide like airplane wings (yep, even in my sleep I’m doing some yoga pose), and I could feel a swelling of warm beautiful loving heat emanating from my heart. In the dream, I could see the glow coming through my chest. It completely took me over and I started to rise off my bed what felt like a few inches. But soon, I noticed my neck started to hurt and in an instant, I crashed down on my bed and woke up. I got up and walked around not knowing if it was a dream or did that really happen? Friends who know me well know that I’m both introverted and extroverted. It’s important for my being to be both – and not just lightly. I love people and I love parties. I also love being alone and can ponder things for hours at a time, simmering on past events. The whole month of March was super busy, so my introverted side has been screaming for attention. I took off a few days and had the chance to review some big moments in the last month- moments worthy of sharing. We recently hosted the USA Yoga West Coast Regional Yoga Competition with our friends BYMV, covering eight states. Over 40 athletes showed up to compete on this epic day, each performing six postures in three minutes. I competed again and managed to get first place and the honor of highest score for the day! Then I got up on stage, and in the silence of three minutes doing the motions of the poses, my mind drilled me on how unprepared I was, how awful this is going to be, how I should have done this, that, and other unworthy “not going to help me right now” commentary. My lovely higher self was like, “Wow, so this is what you feed your mind with.” Even so, my performance went okay – off the stage I went, but I knew my journey was to dismantle that delusional cloud of black smoke. If I didn’t, it would hinder any future victory of any kind. Fast forward to this most recent performance, and in the quiet of my mind is the presence of the gesture at hand as I sang a song of flex your foot, keep your elbows down, breathe, hold and enjoy this moment, etc. Cool! Then, I get to my third posture and without warning, my mind goes, “What are you going to do about your last pose?” as that posture is super hard for me and I know that I need more time to do it. Superbly, my immediate instinct was to turn away from that flaming arrow of negative thought, bringing me right back to my task at hand. I transfigured it even more by soaking in the audience’s vibe of sweet support during each posture hold. I finished nicely, but the true victory was that ability to overcome my negative mental patterns. 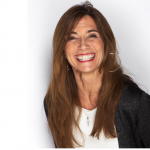 Mary Jarvis, teacher extraordinaire and coach to champion athletes and renowned teachers, came to Bikram Yoga San Jose for a rare one-day visit to teach class and lead a posture clinic. It was to start at 10 am and end at 4 pm. It started at 10:30 am and we ended nine hours later at 7:30 pm. Mary is an artist in this yoga world and you cannot predict or script her. She’s a genius and if you are gifted with the blessing of her presence, you won’t want to leave. Allow me to share two of many stand-out moments. After a terrible car accident, Mary was in a wheel chair for a long while. This is how she found the yoga and found Bikram, attending classes including those taught by Bikram several times a week (and many times practicing twice a day). Over the years, she’s healed herself and has endless knowledge on the spine. Not too long ago, she broke her ankle. At the time, she owned a studio in San Francisco for almost 20 years. One day, a long time member that she hadn’t seen in a while came back in to the studio. He told her that he sprained his toe and needed time off to heal. Not knowing that she had a broken ankle, they proceed to take class together. The whole class, he watches her use a chair to support the leg of her broken foot so she can still do every posture as each relates to her spine. She tells the story with such love and humor that you are brimming with laughter at the idea that you should “take a break” from Bikram Yoga if you are injured. The ridiculousness of not showing up because of a sprained toe, hurt hip, tight shoulder, broken finger, sciatica, torn knee, and so forth. To Mary, if you can do something with your spine today, you are in class – no excuses. The spine is the beginning and the end to your health. If it’s there, then you are good. If it’s not, then you are in trouble. It will shape everything, physical, mental and spiritual. Mary said the word “wait” at LEAST 50 to 100 times that Sunday, between class and her clinic. She repeated and reinforced it so often that I’m hoping everyone heard it at least once. Her recommendation in any pose, regardless of the physical condition you are in, is to do it right, find your limit, hold it and WAIT. Do not push the boundaries of the proper pose for the sake of your ego wanting to take it deeper or make it look better. If you do, you sacrifice any real progress you could make. Be wise here: do the pose to your ability and really work it accurately. A good example is Bow Pose (Dhanurasana). If you are in Bow Pose on the floor with knees six inches apart and holding your feet the right way, don’t open your legs wider in order to look up more and kick higher. It’s wrong, because you’ll never increase the flexibility of your spine that way, and a year later you’ll wonder why you haven’t improved! Keep your legs 6-8 inches apart only and WAIT! At the end of the month, we held our 60-Day Challenge Party honoring our students who accomplished 60 Bikram Yoga classes in 60 days. Every year, this is the best event of all. There is little fanfare or preparation, there is no “agenda,” no big promotion, hype, or even food. But for all this simplicity, every time it is our most meaningful, our most intimate event at BYSJ. It’s the Challengers’ special time to pick up their hard-earned T-shirt and share an insight or two on what the challenge has meant to them. You won’t expect what comes out of people, and you’ll come away with a bellyache from laughing, tears streaming down your face from such inspiring stories, and a renewed commitment to your yoga practice! On their own merit, these amazing events are worthy of consideration. Together, all three share a common lesson: they are an invitation to TRUST. Bikram will tell you that when you are a true yogi, in the snap of a finger you can go from one subject to the next with absolute concentration. My mental interruption on stage was unexpected but-in the blink of an eye!-I brought my attention back to the present. My practice gave me the trust to move past a potentially sabotaging moment. Mary Jarvis underscored the discipline to Wait, which takes humility and trust. You never know how long something will take and you just have to trust the process. If you don’t, your hard work is useless. You’ll just stand in one place for the rest of your life. And could you know what a 60-Day challenge will give you? To make it through the rough days, the down-in-the-dirt days, you have to trust that you are capable of becoming more than you currently are, you have to have faith in that possibility! When you do trust, miracles happen: the mind obeys, the body is effective and efficient, and the spirit soars. Your very being is victorious in ways that define and surround your life. You become super-natural, conscious of a power within you that you would not have otherwise discovered. This is the power inherent in Faith that only comes alive when we are at the end of ourselves. In fact, in every one of these takeaways, victory has nothing to do with how much “better” you became in a pose. The victory is in transcending a screw-loose mind, overcoming a junk body, with a healthy spine to have and use for the rest of your life. The victory is attaining love for 60 days– love of self, love for others, love from others. 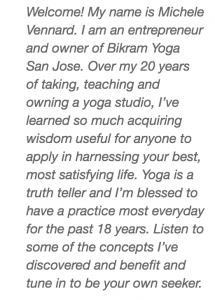 This, my friends, is Self-Realization and the whole reason why Bikram Yoga San Jose exists and thrives. My dream of being wide open, receiving love, and crashing painfully? It tells me that I’ve attracted a faith so great that my heart swells with love and joy. But the warning is there also: in a split second without notice, I can fall if I don’t catch the things that pull me off my course – and Hope is the bridge that gets us to Faith. If I take my class, or head to church, or walk in nature, I can transcend a fallen world and prime myself to Hope again. I see it everyday in you too, members, as you walk in expecting class to deliver on a promise that gets you out of any rut and back to hope, because part of our path in realizing Self includes the relationship of a Spirit within us that is beyond the physical and the mental. So when class delivers hope day after day, faith in something greater is more believable. Therein lies the purpose of Bikram Yoga: it is the best tool for everyone to come to know the unrecognized part of themselves meant to “sustain living in this well of abundant contentment,” – a spirit of peace.